This past Saturday was a delight when I went with friends to TRON: Legacy. The original TRON is a great favourite of mine, and this film is a worthy successor. My friend Kirk beat me to the punch, character-wise, on his blog. I was most satisfied by the return of zen beardy Kevin Flynn & (too-briefly) of noble Alan Bradley, and by the technical accomplishment that is the dastardly CLU. I was adequately served by angry Sam, and my favourite is surely the dashing, gleeful Quorra (seen here from behind, not on Flynn's ever-present couch). Classy, no? But, fun as the picture is, when the writing or the editing (I can't say which until I see a DVD with deleted scenes) removes motivations and FEEELings in favour of MICHAEL! BAY! SPLOSIONS! you can lose the glimmer of overall significance. Thus all due praise and props to: The Daft Punk MP3s. Musical Programs who deftly sweep us along and deliver the pulsing heartbeat that keeps this movie truly alive. Cool, robotic, driven, and soulful all at once. The religiously zealous old-school TRON-fanatic Users who Wrote these living embodiments of electronica gave non-verbal voice to the hidden heart of this flick. 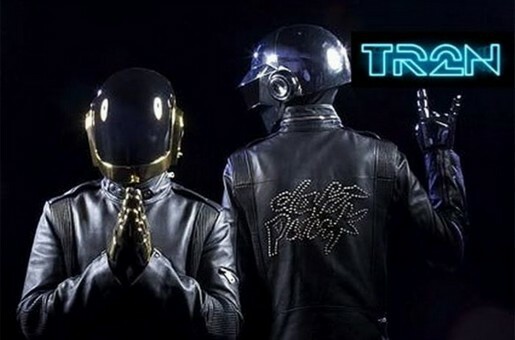 Thanks, Daft Punk! If the head of dialog fell too silent for my tastes, this movie is still a success in the visceral realms of thrilling sights and bit-blasting soundtrack. Like the Max Rebo band before you, I can only hope you got offstage before the explosions.